Vienna, city of dreams. Former capital of a vast empire. One of the best stage sets in Europe. The traumatised birthplace of modernism and the eastern outpost of the western world. A magnificent open air museum of charming manners and irresistible pastries. And once upon a time, I lived there. It was 1976 but it may as well have been 1889. It was hard to tell the difference. I was holed up in a tiny Biedermeier apartment with no heat but thanks to a fortuitous introduction, was taken in hand by a family of minor aristocrats whose old world eccentricities exceeded all expectations. I was besotted, with them and with the Hapsburgs, Gustav Klimt, Sigmund Freud and The Third Man. So when the Editor suggested that we head for Vienna for three days, I practically wept. I love no city more than Vienna but how would the reality of Vienna 2009 compare to my memories of Vienna 1976? And typical of Vienna, the city of dreams, we found it exactly the same and utterly transformed, all at the same time. With the reopening of Eastern Europe, the former capital of the Austro-Hungarian Empire got its “backyard” back. The grime of centuries has been blasted off the buildings. The place glistens with purpose and renewed energy. The coffee houses are full of men and women conducting business. Vienna is once again smart and stylish. I never thought I would live to say this: “Vienna is a happening place”. A case in point was the hotel we stayed in on the Herrengasse in the 1st District, close to the Hofburg (the Imperial Palace) where formerly the Hapsburg nobility built their palaces. Today, the SAS Radisson Style is a sassy 72 room boutique hotel with “art nouveau revisited” décor and a popular bar that is well frequented by locals. Sometimes, it may be a bit too happening. On one of the nights when we were there, the whole ground floor was taken over by the Argentine Embassy. These are not folks who like to go to bed early. But it was fun to stay in a place with some attitude and lots of local action and at £86 a night for one of the best addresses in town, plus free wifi and minibar, it represented good value. Culturally, things in Vienna have heated up as well. For example and thanks to a tip from one of our twitter buddies @Travelwriticus, we paid a visit to the Karlskirche (St Charles Church) to try out the Panorama Lift. Karlskirche is a magnificent baroque church boasting a spectacular dome covered in frescoes. 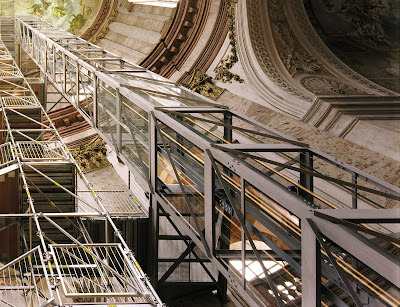 Following a recent restoration, the scaffolding, elevator and stairs have been left in place so that tourists can zip up by elevator to a platform 32.5 meters/107 feet above the ground and from there, climb more stairs to the top of the dome. Who knew art history could be so terrifying or exhilarating, or that even the most solid looking scaffolding shakes a lot when you walk on it? I loved the sign which said “There may be no more 10 people standing on the platform at one time” although there is no one around to control the number so I spent my air time admiring the magnificent frescoes and counting my fellow viewers. As the actor Christian Bale said after filming Batman on top of the Sears Tower in Chicago, I found it “disturbing but enjoyable”. Belvedere Palace – A spectacular “in-town” palace with lovely gardens and some iconic Austrian art. Klimt, Schiele and Kokoschka are there. So are lots of tour groups but they’re widely dispersed. Kaisergruft – Under the Kapuziner Church lies the Imperial crypt with the remains of 138 Hapsburgs. It’s the best history lesson in town. Most poignant tomb is that of Franz Josef who lies next to his glamorous assassinated wife, Elizabeth, and his son, Crown Prince Rudolf who committed suicide. The most fabulous award goes to the gargantuan “his and her” sarcophagus for Empress Maria Theresa and Emperor Francis 1. As for shopping in 2009 Vienna, there’s good news and bad. The formerly chic Kartnerstrasse has been colonised by cheap, global chain stores. Even the gilded, E Braun & Co building, once a purveyor of linens to the Imperial household is now an H&M but down the street, chandeliers like the ones at the Metropolitan Opera House and the Kremlin are still on sale at J & L Lobmeyer run by the fifth generation of the same family. (If you’re not in the market for a chandelier, you can visit the small but superb glass museum on the first floor.) Loden Plankl, Vienna’s oldest specialty store for traditional clothing on Michaelerplatz still serves up beautifully made, authentic Austrian clothing and the gourmet grocery emporium, Julius Meinl am Graben, is still the place to go for smart foodie gifts, as is the Naschmarkt, a market that has been operating since the 17th century that sells everything from food from around the world to bric-a-brac. If you are serious about looking for art and antiques, head for the Dorotheum Auction House on the Dorotheergasse which began its life as the city’s pawn shop in 1707. Great for jewellery, paintings and furniture, it’s a wonderful place to browse, no one bothers you, and many of the objects can be purchased over the counter on the day. And what about the food and those famous Viennese coffee houses? Being devoted to the classic Austrian dishes of boiled beef, goulash and schnitzels, we made pilgrimages to our old stand-bys which haven’t changed a bit. Here are three solid, authentic and inexpensive restaurants where you can sample the local specialties and atmosphere. J.S Smutny – on the Elisabethstrasse, a small street on the other side of the Ring from the Opera House. The Editor's favourite. Maybe the best beer and nicest staff in town. They invited us to watch the Chelsea/Barcelona football match with them and we had a blast. Gmoakeller – on the Heumarkt behind the Konzert Haus, Best all around combination of food, atmosphere and service. One of the oldest restaurants in Vienna and once a favoured hang-out for Crown Prince Rudolph and his ill-fated paramour, Mary Vetsera. Café Central – Next door to our hotel and exactly as a grand, old Viennese café should be. A favourite of Trotsky, Schnitzler and Freud. Lots of tourists but who cares – it’s worth it. Café Landtmann – a favourite of journos, politicians and theatregoers, this is the place to see and be seen. By the way, the food, that 30 years ago I could never afford, was excellent. And all too soon, it was time to leave this amazing city returned to life by a new geo-political purpose. Being the new portal to eastern Europe has been good for Vienna but much to my relief, this town has lost little of its old magic. We’ll be back. Photo of Karlskirche Panoramalift courtesy of "Verein der Freunde und Gönner der Wiener Karlskirche"
Maybe not a Freudian slip but Christian Bale was in Batman, not Barman. Of course "Barman" was a Viennese inspired Freudian slip! Well spotted and thanks.